It's the little things that make all the difference, which is why you're going to love the Edge 130. Compact and lightweight, easy to mount on shorter stems and can even come with a mountain bike (MTB) mount to lift the device above the stem while keeping it safe. The 1.8 inch mono Memory in Pixel (MIP) display means you get a completely crisp view of the screen, even in direct sunlight when you'd normally be squinting. A five-button interface is easy to navigate, and you can even customise the display to show up to 8 data fields on each screen. Surprisingly, Edge 130 is compatible with powermeters including Vector, letting you see how many watts of power you're producing on a flat section or a steep hill. Compatible with Strava Live Segments so you can give yourself that extra nudge to really push yourself. Edge 130 is compatible with our Varia line of cycling awareness devices, including rear-view radar and smart bike lights. Let friends and family follow your real-time location with the LiveTrack feature. If you happen to run into difficulty during a ride, the Assistance feature can quickly send your current location to chosen contacts so they know where to find you via your smart phone. Text messages will appear on your device screen so you can see them at a glance and keep right on riding. Pair Edge 130 with a Forerunner 935 or Fenix 5 to use the Extended Display option ÔÇô especially useful for looking at your progress on the bike during a Triathlon. 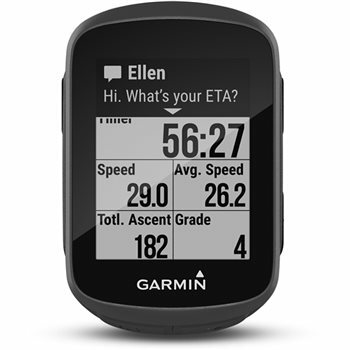 Wirelessly upload your rides to the Garmin Connect online community, and customise your device from our Connect IQ store by downloading configurable data fields such as the GU Fuel Reminder or Strava Suffer Score. Up to 15 hours of battery life between charges.